My client, Karen got out of a marriage that lasted almost three decades and although she would admit that she wasn’t happy in the marriage, his leaving left her heartbroken nonetheless. She didn’t know how she would move on and she certainly didn’t know if she would ever find love again. She had to come to terms with sharing her son with her ex and his new girlfriend. She had to make peace with him moving on so quickly and now living what appeared to be an idyllic life…without her. After working together, when she was far enough removed from the pain of that relationship, Karen was able to see that he was in her life to get her to see how she was subjugating all her needs and wants in her own life. He was there to push her to the edge where the truth was staring her in the face: until she became a priority in her own life, she wouldn’t be in anybody else’s either. And as long as she felt like she had to keep giving and giving and giving, he would drain her through the constant taking and taking and taking. He was there to help her come to the place where she could really love and appreciate her heart and honor her needs and wants. Since then, Karen’s had a few intimate relationships that also presented some important lessons. One man showed her that she was, in fact, desirable and lovable. Another showed her that you can have a man who is both strong and protective, as well as gentle and kind. 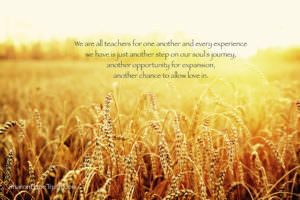 We are all teachers for one another and every experience we have is just another step on the path of our soul’s journey, another opportunity for expansion, another opportunity to allow love in. From that softer perspective, we can move our lives forward and not remain stuck in the pain. Karen was able to leave behind the hurt, but keep all the lessons. She was beginning to embrace who she was and getting clear about what she wanted to experience in a relationship. She was beginning to see possibilities for her life that she didn’t think were possible just a few short months ago. Karen, while willing to do the work to face her deepest fears and no longer carry the pain of the broken relationships, was able to finally find the good in goodbye.